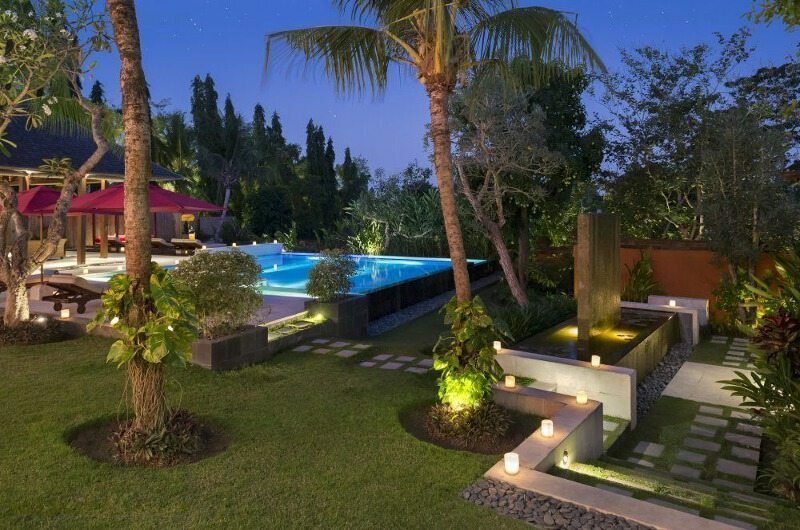 Astika Toyaning offers an appealing combination of modern design and tropical living and features two swimming pools. Astika Toyaning offers an appealing combination of clean modern architecture and artful Indonesian influences in a peaceful nook of trendy Canggu neighbourhood in Bali, Indonesia. 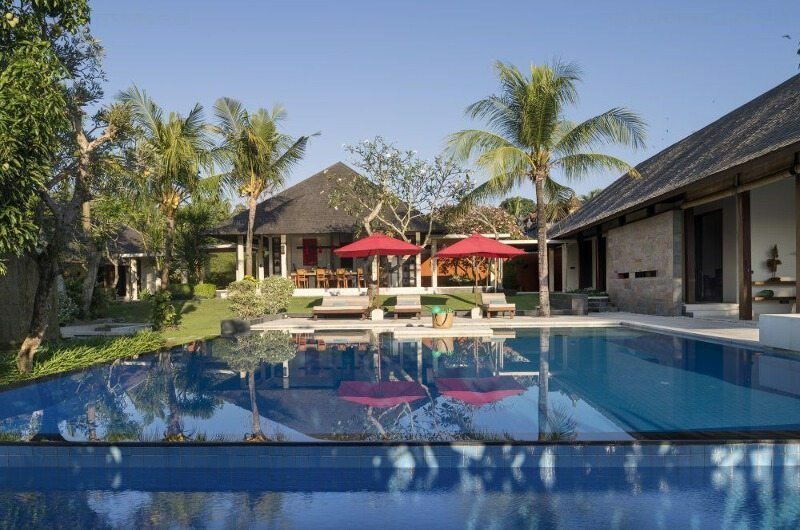 Boasting two swimming pools and ample room to entertain, Astika Toyaning offers a peaceful setting within the Pangi River Estate state just moments from the trendy restaurants and surf breaks of Canggu. 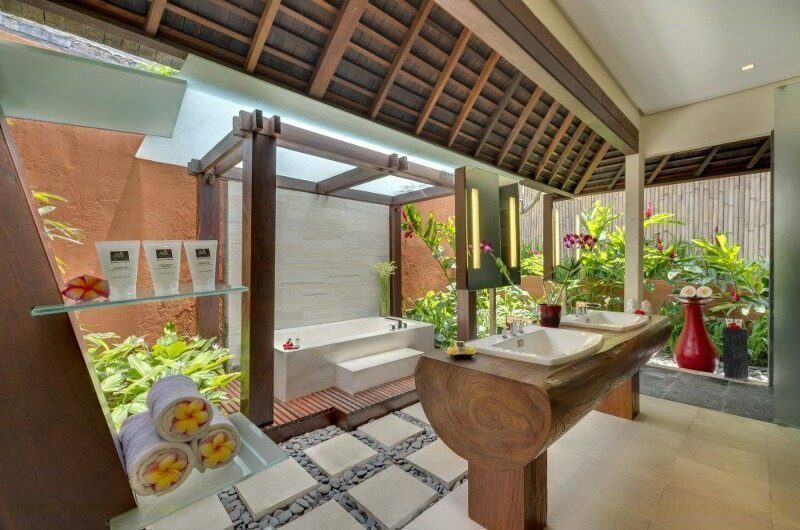 The villa features four bedrooms, each uniquely designed with Asian influences and adjoined by a decadent outdoor bathroom. 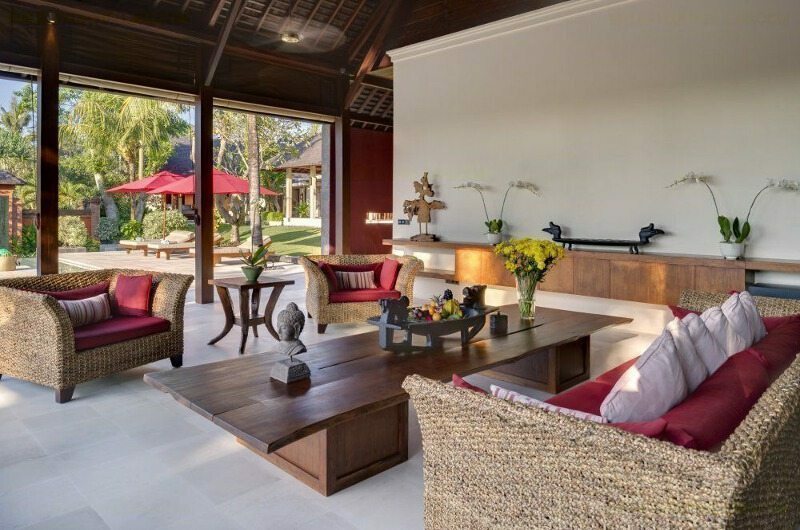 The living areas have a breezy open-plan layout, allowing guests to take in Bali’s eternal summer in style. 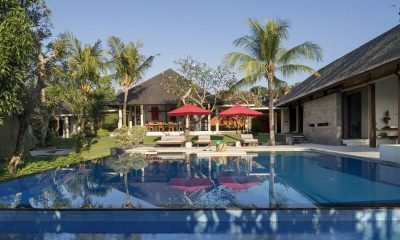 If you’re travelling with a larger group, Astika Toyaning is located within the same complex with Villa Mata Air, Villa Bunga Pangi, Tukad Pangi Villa, Villa Pangi Gita, Villa Frangipani and Villa Bunga Wangi. 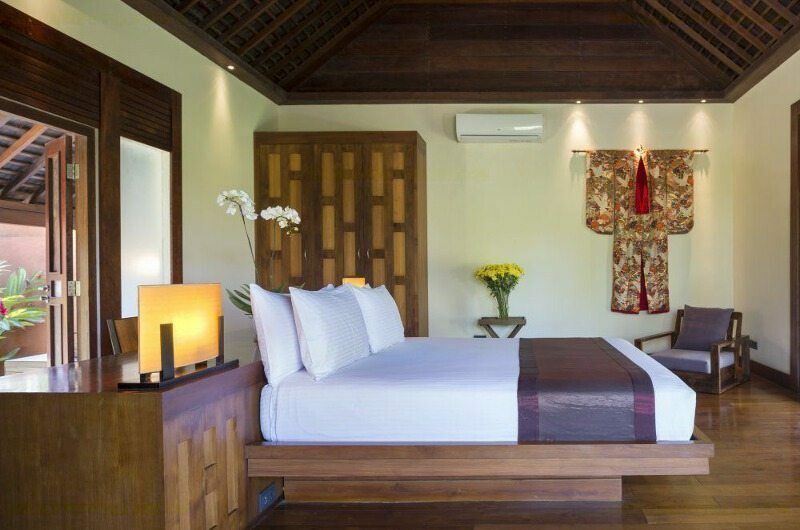 Astika Toyaning offers a winning combination of modern design and Balinese details, offering the perfect holiday retreat for travellers looking for an authentic Balinese experience without sacrificing one ounce of modern comfort. The open-sided living and dining areas are strategically positioned to offer direct views of the villa’s two swimming pools. 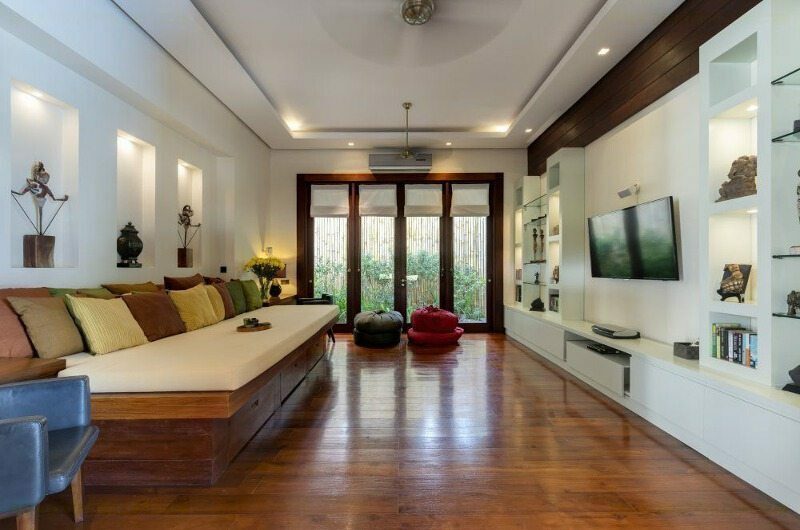 Located to the side of the two swimming pools, Astika Toyaning’s living room has a tropical open-sided layout with the space crowned by a high alang-alang ceiling. 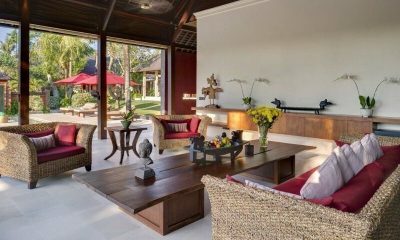 The spacious room is furnished with a rattan sofa and two armchairs softened by plush red cushions, with subtle Indonesian art pieces adding an exotic twist. Next door is an air-conditioned TV room for watching your favourite TV shows and latest blockbuster movies. The dining pavilion sits on the highest point of the property, offering photogenic views of the two azure swimming pools. A generous dining table sits surrounded by up to 12 chairs, with a sleek show kitchen followed by a separate staff kitchen located to the back of the building. 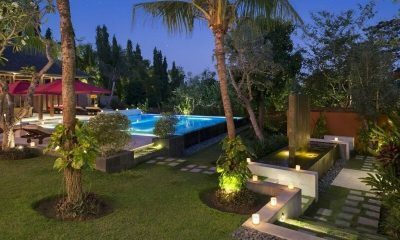 Astika Toyaning boast not just one but two swimming pools beautifully carved to the villa’s cascading gardens. The first is a 10-metre square pool followed by a narrow 20-metre lap pool. 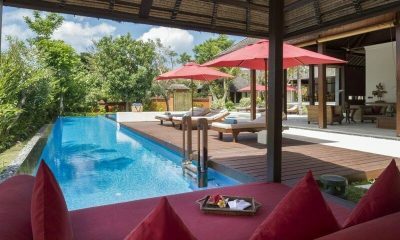 The generous sun deck is dotted with white sun loungers and red parasols, with the tropical scene framed by leafy green gardens. 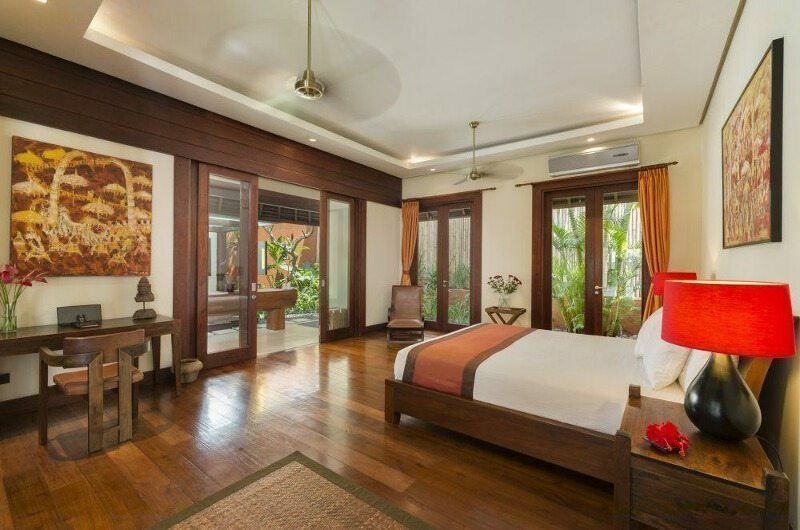 Astika Toyaning has four bedrooms: three rooms have a king-sized bed and one room has two single beds. The rooms are divided into two pavilions, with two rooms located next to the living room and media room and two further rooms located side by side in a standalone pavilion. 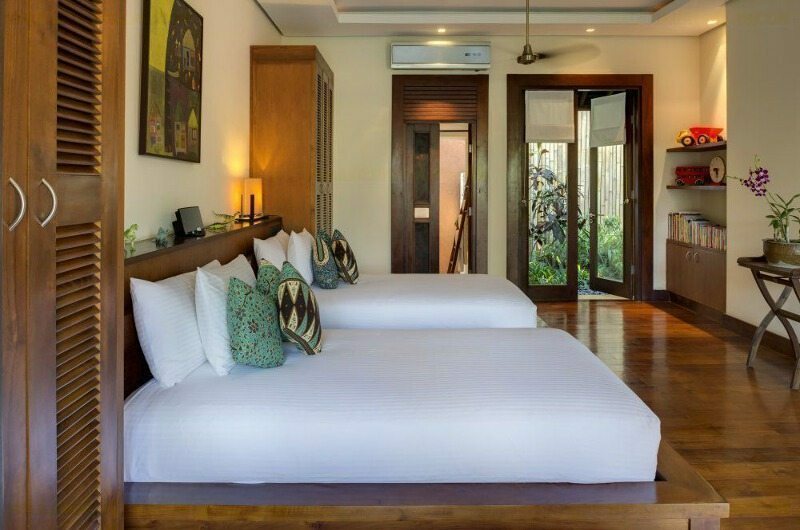 The master bedroom is located in the living pavilion next to the twin-bedded room. 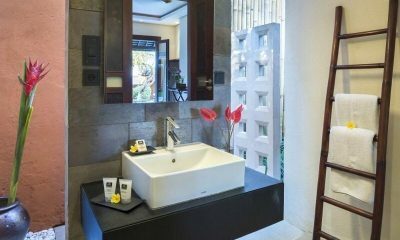 The room has a king-sized bed and a luxurious ensuite bathroom with a semi-open layout, a bathtub, twin basins and a shower. The second bedroom is located next to the master bedroom. This room has two single beds, making it ideal for kids. 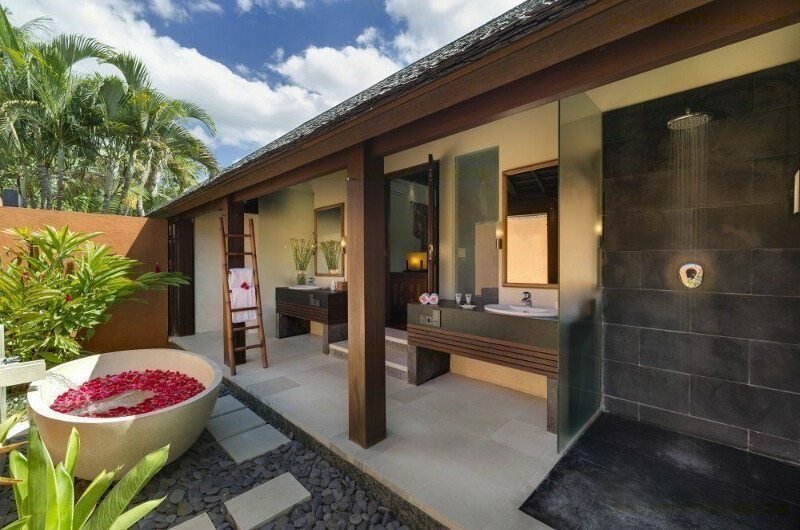 The room has a semi-open ensuite with a shower. 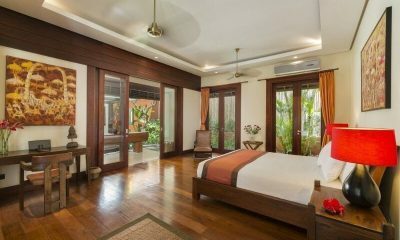 Bedroom 3 is located in a separate pavilion together with bedroom 4. This room has a subtle Japanese theme with a kimono hung on the wall. 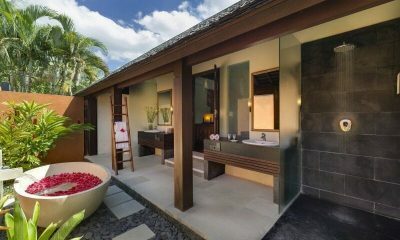 The room has a king-sized bed and an open-air bathroom with a bathtub and shower. Bedroom 4 is located next to bedroom 3. 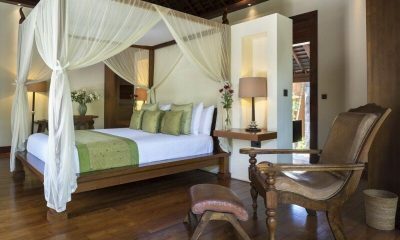 This room has a Thai theme and features a king-sized four-poster bed. 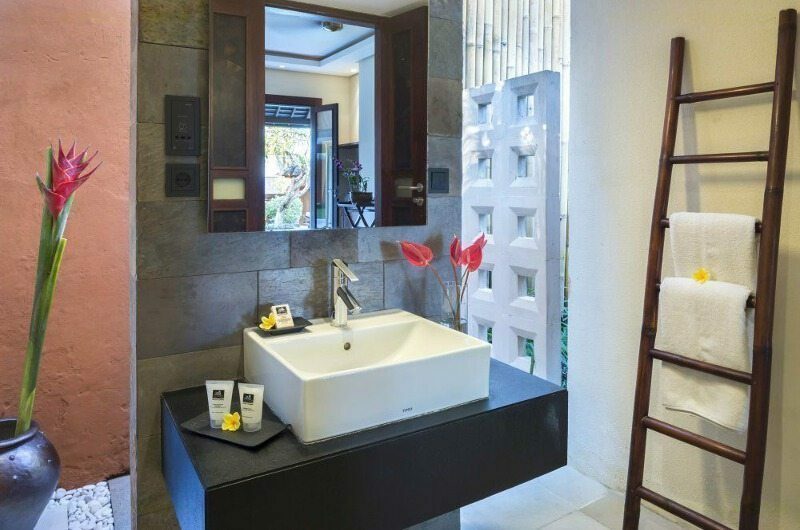 The ensuite bathroom has a sunken bathtub and shower. 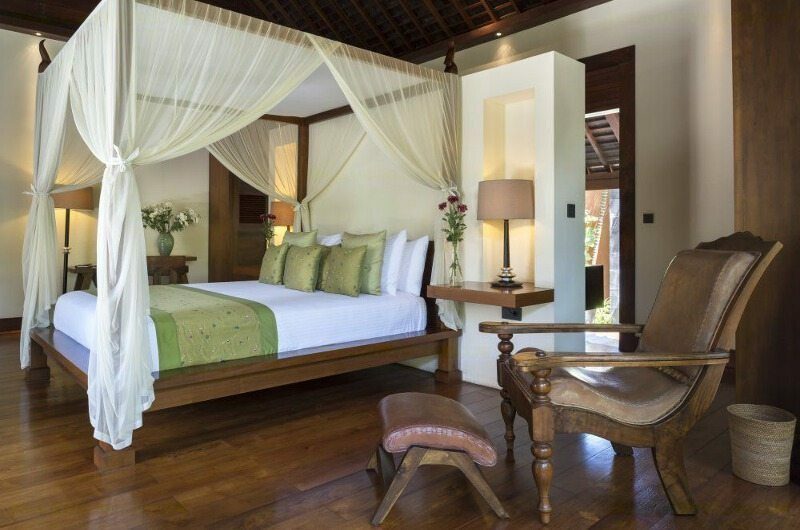 Astika Toyaning is a four-bedroom villa that’s divided into three pavilions spread over vast gardens. The first building includes the open-sided living room, enclosed media room and two bedrooms. 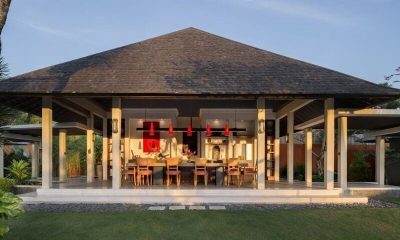 The second pavilion houses the open-sided dining room and kitchen. The third pavilion houses two more bedrooms. The villa has two swimming pools; one is 20 metres long and the other measures at 10 metres. Your stay in Astika Toyaning is made enjoyable by the professional staff. 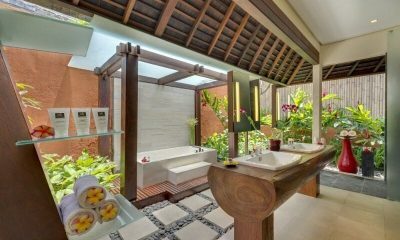 Astika Toyaning’s staff have been professionally trained and will do their utmost to please with their warm and friendly Balinese hospitality. A chauffeur will provide you with the ultimate experience! A car and driver can be a great way to explore you holiday destination. Villa rates include a six-seater car and driver on stand-by for up to eight hours of complimentary guest use (excluding petrol). 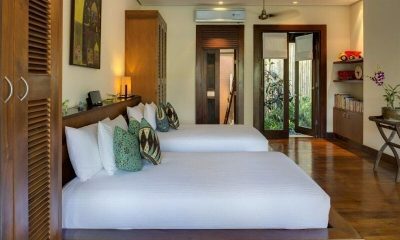 Astika Toyaning is located in a peaceful area of the trendy Canggu neighbourhood in Bali, Indonesia. 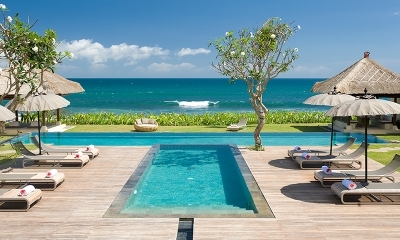 Canggu has fast emerged as one of the hottest destinations in Bali, offering world-class surfing, dining and nightlife. If you’re travelling with family, a visit to Finns Recreation Club is a must and guests at Astika Toyaning are treated to a complimentary membership to the club. 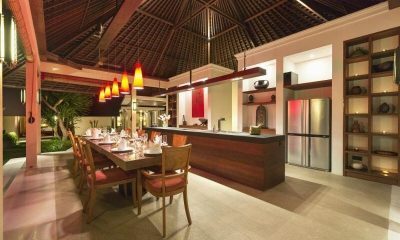 Astika Toyaning is within a 10-minute drive from Pererenan Beach and the same goes for the popular restaurants lining trendy Jalan Pantai Batu Bolong. Traveling with our friends with a total of 4 Adults and 4 children we enjoyed a fabulous long weekend at the Villa Astiki Toyaning. The Villa itself it well equipped- from the TV room filled with games and toys to the Bose system inside and out. There is plenty of space for children to play and a 2 great pools suitable for splashing and more serious swimming. The location in Canggu is good the only downside is the traffic from 3pm onwards. The highlight of the trip was the excellent food prepared by Chef Nyoman. All the food was freshly prepared and had wonderful taste. Mr Nyoman was great at preparing more mild flavors to the kids! In addition to great food all the staff that looked after us were great with smooth transfers and friendly attentive service. 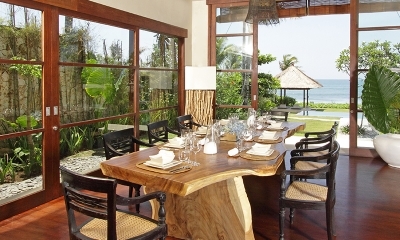 There are hundreds of marvelous places in Bali where one can rent a gorgeous Villa. What really makes a difference is how the staff interacts with the guests, this differentiates a good from an unforgettable experience. 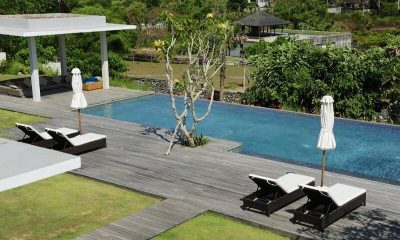 At Villa Astika Toyaning un Canggu, we found such an unforgettable experience. Our cook served us each day a perfectly cooked meal, morning, lunch and breakfast, each time according to the wishes of our palates. Be it a great cheeseburger, spicy local dishes, or straight forward good for the kids, the food was always the best we could hope for. Truly amazing, and Michelin Star level, with guaranteed local and organic products!! All other staff completed the experience with caring and attentive presence, ensuring that we felt well 24/7, without actually feeling that we were spoiled throughout! 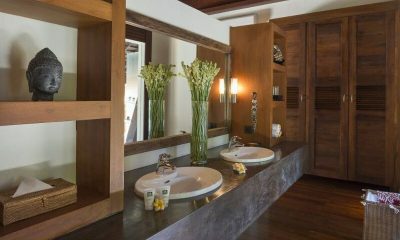 It goes without saying that the Villa overall and the surroundings were impeccable, homey and very special. Our vacation in Villa Astika Toyaning was one of the best we had, and we will for sure be back in this gorgeous place, with its very special staff! 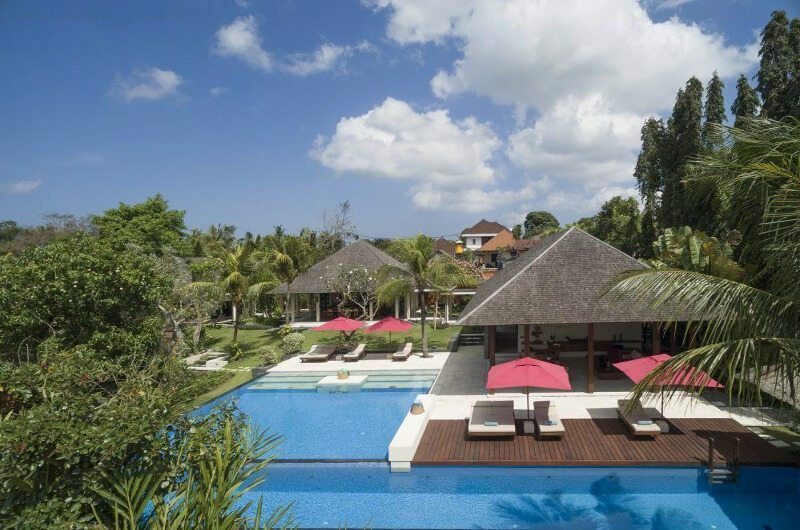 This luxury villa in Bali was absolute Paradise for our family holiday. Situated out of town but close enough to local bars and restaurants. 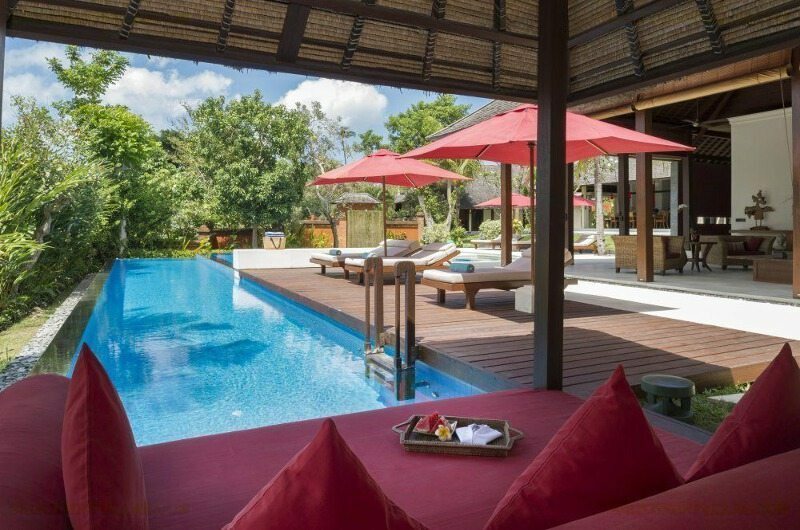 However, no need to venture out at all as the staff at the villa provide for every need and the pool,and poolside is perfect for relaxing every day. You can even book masseuse to come in and have a nice massage by the pool – which we did several times! The chef and staff were amazing – so friendly, and a great cook. Beef rendang was special, and we must have gone through hundreds of satay sticks in the week. Membership of the nearby Canguu Club is great – with its water slides and many things for kids to play on. We travelled there with another family. Plenty of space in the villa and grounds, highly recommended for a very relaxing holiday with family and friends. That’s what the kids said as we opened the double wooden doors and stepped into another world. Attentive and gracious staff could not do enough for our family. Chef went out of his way to shop for special ingredients and modify the menu to suit one of our kid’s special dietary requirements. Walking through the ornate front door our jaws dropped.We were greeted by an oasis of style warmth and that pool!! Deni was there smiling and handing us our cool towels and refreshing lime drink that became a staple sipper each day! Nayoman had prepared a scrumptious healthy meal( emailed a request the day before our arrival!) and we relished in the fact that this was to be our life for the next 10days. In fact the most difficult task was what to choose from the extensive menu each day! We settled into our huge well appointed rooms for the night, with a question of “what time would you like breakfast?” being our only task. Our children were in heaven , and whilst they frolicked in the pool, we swam our laps,read our books, drank our cocktails and waited to be called to each meal.The villa is perfectly set out especially for two families. 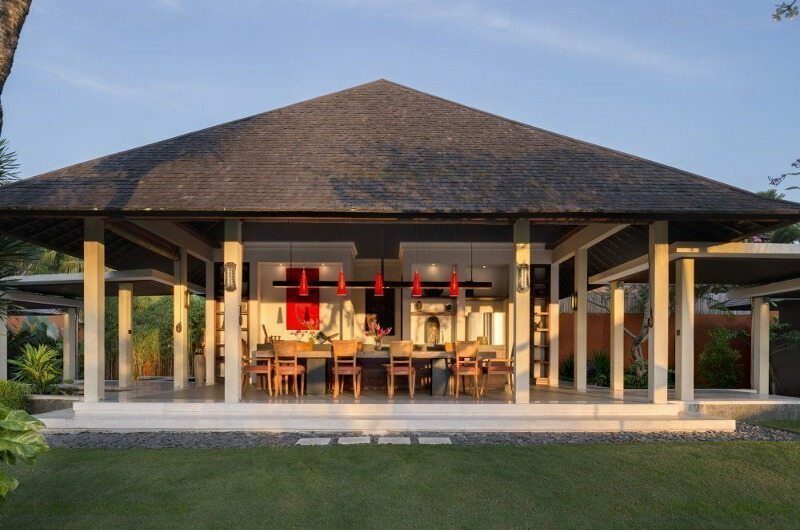 Two separate wings are joined by Koi carp ponds and the dining room, so you can eat and watch your kids play in the pool safely. We were a party of 8 and we never felt cramped. We all had our favourite spots to relax and read, that was when we weren’t having massages booked by Deni and performed in the media room! We chose astika because it was close enough but far enough from the bustle of Seminyak, and as Sydneysiders we believed we’d go out lots and sample the many restaurants that had been recommended to us, with the use of the worlds most friendly driver, Gede. Not so! One night out and although Mamassan was delightful, we all concluded dinner by our pool cooked to perfection by Nayoman was far better. Really, you dont want to leave this place. Putu and Deni cared for us with such grace and privacy that we felt that if we needed anything we could ask them. We are already trying to figure out when we can all return. 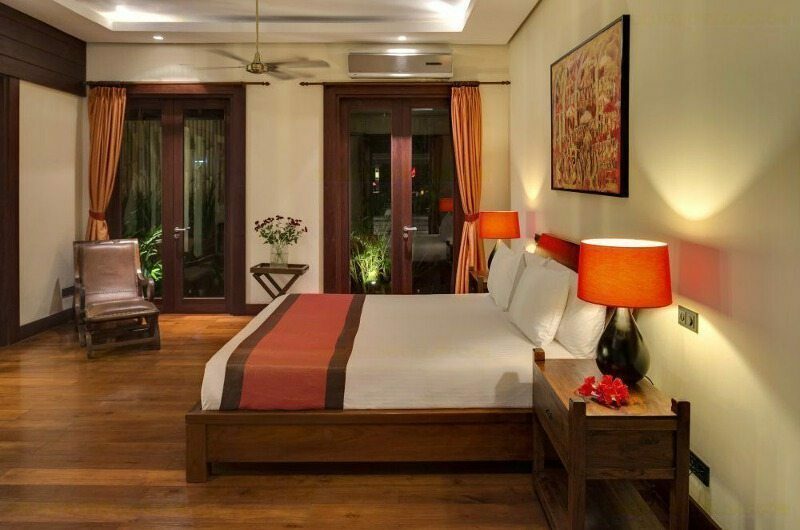 Villa Astika Toyaning certainly lived up to our high expectations. The gorgeous photos don’t lie. 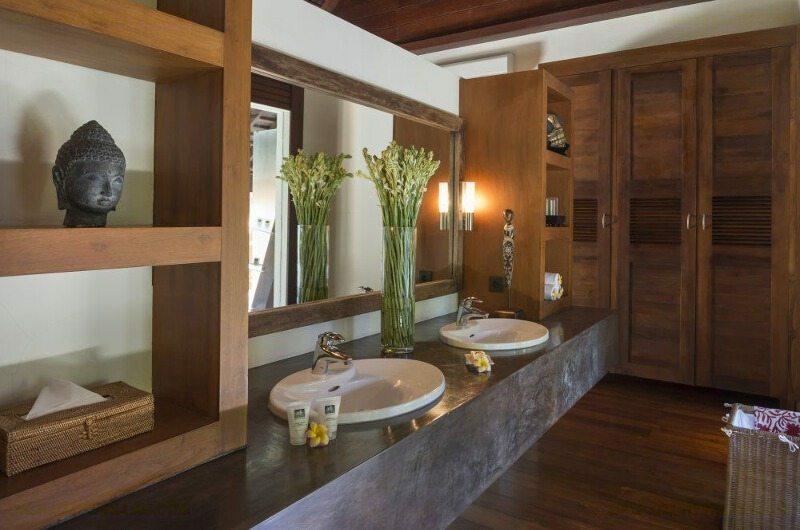 This Villa was every bit as stunning and spacious as the photos suggest. The gardens and pool are immaculate. All four bedrooms are stylish and beautifully appointed without being over the top. The bathroooms are heavenly. The large tv/media room was a great place for the children to relax from the sun with a huge day bed to curl up on. The villa also has a large selection of toys, board games, books/dvds (for kids and adults) to occupy everyone. 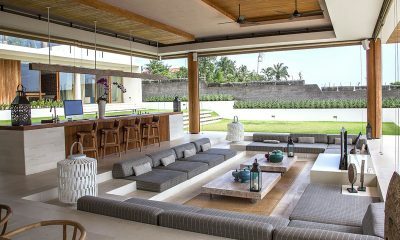 The outdoor living room overlooking the pool and poolside bale was a great place to relax with very comfortable furnishings. 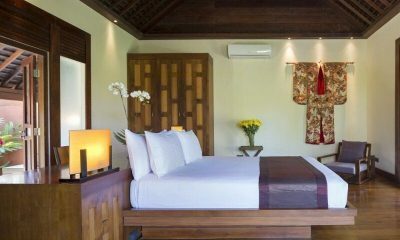 The clever layout of the villa is perfect for two families as there are two bedrooms either side of the main pavilion allowing for a little privacy per family. 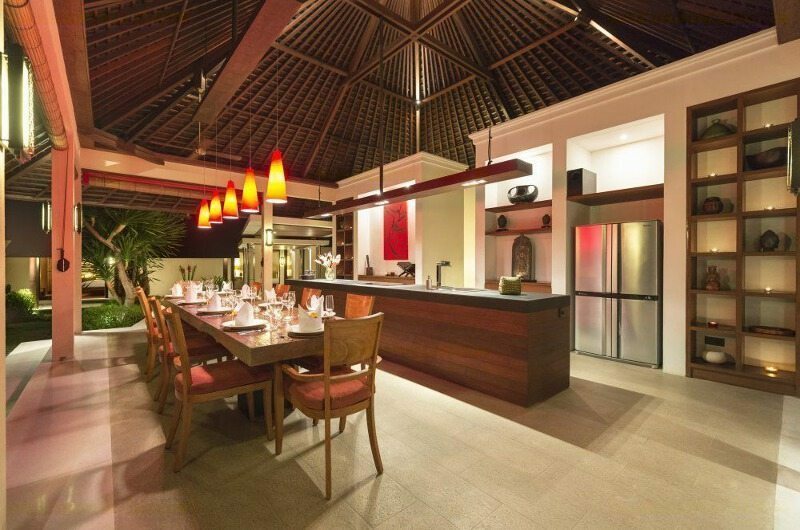 The main dining pavilion was enjoyed by all, especially with our wonderful chef Nyoman to wow us each meal. Nyoman was a great host extremely eager to please every mealtime. The breakfast selection was wonderful with fresh fruit, toast, pancakes, eggs and bacon. He catered to the childrens’ more basic tastes serving anything from fresh crumbed fish and chips to spaghetti bolognaise. We enjoyed outstanding Indonesian cuisine (at our request, as Nyoman would have been happy to cook Western style too) superbly fresh every day. All the staff were very friendly. A special mention also to Gede our driver – a lovely young man who always offered timely service with a huge smile !!! 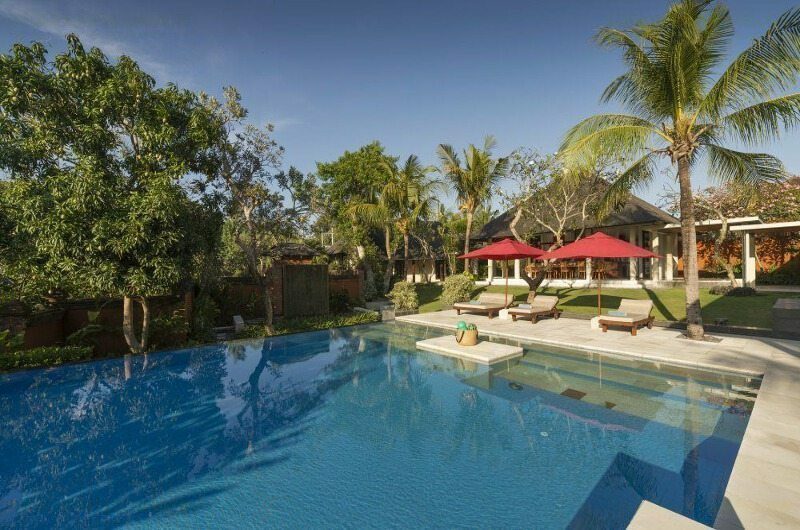 Whilst due to traffic this villa is a little further from Seminyak than expected (a good 25-30 min drive), we wouldnt hesitate staying here again, and we would certainly recommend this property to friends and family. 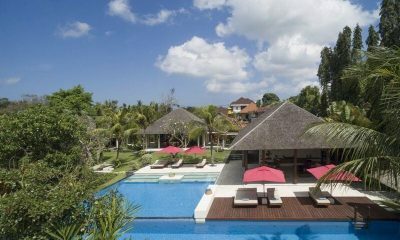 Villa Melissa is a sumptuous beachfront retreat featuring two swimming pools and unrivalled views of the Indian Ocean. 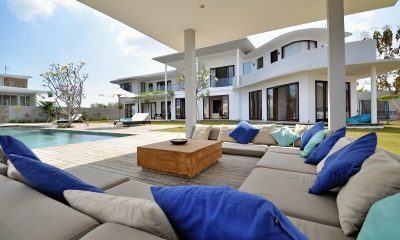 The Iman Villa is a chic and stylish designer villa surrounded by rice fields just moments from the trendy buzz of Canggu.